Updated Tuesday January 1, 2019 by Gloucester Minor Lacrosse Association. Anyone serious about hockey should be playing lacrosse. From Gretzky to Tavares, Shanahan to Stamkos, Canadian-born NHLers recommend playing lacrosse in the summer to improve hockey skills. "It's lacrosse that helped teach me to spin off checks, take shots and protect the puck under pressure. My stick skills, the way to read the play quickly comes from lacrosse. The hand-eye coordination, is just one of the little things that helps you in hockey." I could hardly wait to get my lacrosse stick out and start throwing the ball against the walls and working on our moves as we played the lacrosse equivalent to road hockey. All the good hockey players seemed to play lacrosse in those days and everyone of them learned something from the game to carry over to the other - things athletes can only learn by mixing up the games they play when they are young." Both hockey and lacrosse are high tempo, physical team sports that have similar elements to the game. Both sports utilize 5 players and a goalie, three periods and a strategy of developing odd-man situations to create scoring opportunities. 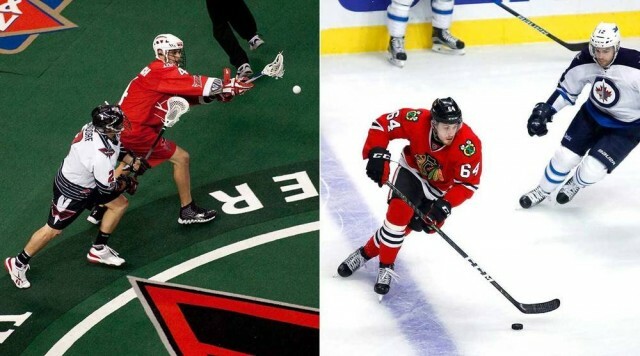 Hockey players excel in Lacrosse, and, in turn, they become markedly better hockey players. Want to know more? Check out this article highlighting the impact that lacrosse has had on some current NHL players. One more reason - it's FUN!